Glass bottles, once they've been emptied, don't need to become garbage. Instead, they can be turned into art -- plates, ornaments, and decorations -- through the process of "slumping," in which the glass is placed in a kiln and heated until it becomes soft. (Reference 1) With the right tools, you can even stretch the glass before it cools down. 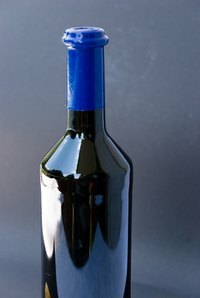 Heating the glass carefully will ensure that it keeps its color and texture while allowing you to reshape the bottle. Buy devitrification fluid from a craft store and spray it on your bottle if the bottle is made of colored glass. This will keep the color consistent while you melt, reshape, and cool the glass. Hang the bottle by its neck from the top of the kiln. The easiest way to do this is to use a pair of pliers to cut pieces of coat hanger wire and loop them around the neck of the bottle, just below the wider part at the top of the neck. Do this several times, until you have 5 or 6 pieces of coat hanger wire wrapped around the bottle neck. Bend the wires downward so that their free ends extend several inches past the end of the bottle. You can then stand the whole thing inside the kiln. The bottle will hang from the wire loops and stretch downwards under its own weight as it heats up. Set the kiln to warm at 500 degrees per hour. This is the safest speed to heat glass without risking thermal shock. (Reference 1) When the kiln gets up to 1100 degrees, stop the temperature increase for 10 minutes, then continue heating the bottle at a slower rate of 250 degrees per hour. (Reference 1) The glass will start to stretch downwards as the kiln heats. Crack the lid of the kiln very briefly, until the kiln cools to 1100 degrees. This will keep the bottle from turning cloudy. Once this is done, just turn off the kiln and let it cool naturally back to room temperature. This is called "annealing" the glass, and is the final step. Once it has cooled, just open the kiln, pull out your stretched bottle, and use your pliers to remove the wire frame that was holding it up. Be very careful when handling hot glass; if it touches your skin, it will burn you severely. If you do this project properly, you should not need to touch the bottle until it has fully cooled.